4. Treat for shock, just as you would for a thermal burn. For chemical burns of the eye, make sure that the casualty does not rub the eyes. Immediately flush the eyes with large quantities of fresh, clean water. Have the casualty lie down with the head turned slightly to one side. To flush the eye, pour water into the inside corner of the eye and let it flow across the eyeball to the outside corner. The water must not be poured with any greater force than is necessary to sustain the flow across the eyeball. Because of the intense pain, the casualty may be unable to open the eyes. If this occurs, you must hold the eyelids open so that the water can flow across the eyeball. After irrigating the eyes, loosely cover them with a sterile dressing. Treat the casualty for shock. Electrical Burns. - Electrical burns are more serious than they first appear. The entrance wound may be small, but as electricity penetrates the skin, it burns a large area below the surface. Usually there are two external burn areas: one where the current enters the body and another where it leaves. Before administering emergency treatment, remove the casualty from the electrical source. If equipment is involved, shut it off or disconnect power it immediately. 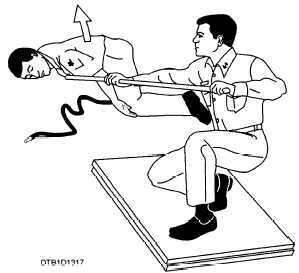 When rescuing a casualty who is in direct contact with a power line, stand on a well-insulated object, and use a dry rope or a wooden pole to either push or pull the wire away from the casualty, or the casualty away from the wire (fig. 13-17). Do not touch the casualty until this is done or you, too, will become a casualty. Figure 13-17.- Pushing a casualty away from a power line. itself. Start cardiopulmonary resuscitation (CPR) (explained in Dental Technician, Volume 2, NAVEDTRA 12573, chapter 9) immediately and continue until the casualty regains a normal heartbeat and breathing pattern. Finally, lightly cover the site of the burn with a preferably dry sterile dressing, treat for shock, and transport the casualty to a medical facility. HEAT EXPOSURE INJURIES. - Excessive heat affects the body in a variety of ways. When a person exercises in a hot environment, heat builds up inside the body. The body automatically reacts to get rid of this heat through the sweating mechanism. If the body loses large amounts of water and salt from sweating, heat cramps and heat exhaustion are likely to follow. When the body becomes overheated and cannot eliminate the excessive heat, heat stroke will result. Heat Cramps. - Heat cramps usually affect people who work in hot environments or who engage in strenuous exercise without acclimatization and proper training. Excessive sweating may result in painful heat cramps in the muscles of the abdomen, legs, and arms. Heat cramps may also result from drinking ice water or other cold drinks either too quickly or in too large a quantity after exercise. Muscle cramps are often an early sign of approaching heat exhaustion. Muscle spasms or heat cramps usually last only a few minutes and disappear spontaneously. To provide emergency treatment for heat cramps, move the casualty to a cool place. Heat cramps are caused by loss of salt and water, so give the casualty plenty of water to drink, adding about 1 teaspoon of salt to a quart of water. Apply manual pressure to the cramped muscle, or gently massage it to relieve the spasm. If the heat cramps do not pass, or if they become more severe, other symptoms may follow. The casualty should be treated as a heat exhaustion casualty and then transferred to a medical facility for further treatment.